Travelguru is India's largest Hotel Network. It offers the best prices on hotels and holiday packages globally. You can select from over 4,30,000 hotels across the globe including 40,000+ hotels in India from 1100+ cities. Travelguru provides the best deals on hotels, making your holiday or a business trip convenient and memorable. It has a range of hotels for every customer, from budget hotels to luxury hotels with lowest price guaranteed. 1. Visit TravelGuru offer page here. 4. 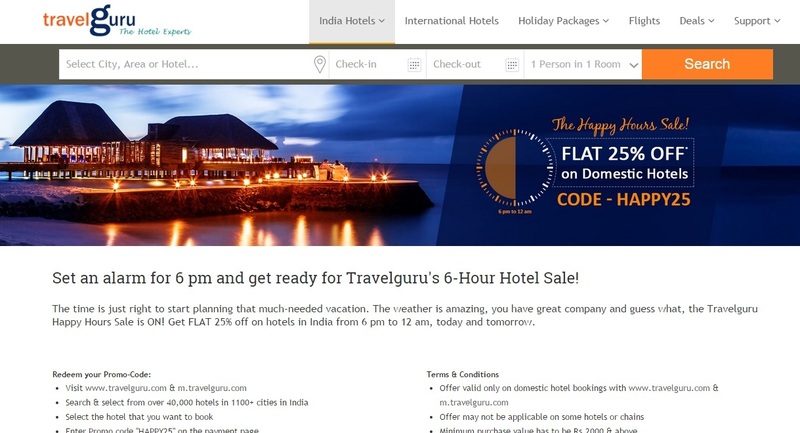 Enter Travel Guru Coupons - Promo code "HAPPY25" on the payment page to get Flat 25% discount. 1. Travelguru offer is valid only on domestic hotel bookings with www.travelguru.com & m.travelguru.com. 3. Minimum purchase value has to be Rs.2000 & above. 4. Maximum discount up to Rs.2,000. 6. This Offer cannot be clubbed with any other offer that may be made available on Travelguru. 7. Travelguru reserves the right to withdraw the offer without prior notice.